This is one pontoon boat that goes fast enough to earn a speeding ticket, in some places. If you’re one of those guys who still makes fun of pontoon boats, believe me, I understand the temptation. For a long, long time I thought these things were a joke among “real” boaters. But then some manufacturers started really pushing the pontoon limits; in the past five years we’ve seen 30′ long pontoons with twin engines and joystick controls; pontoons that were (well) designed as dedicated fishing pontoon boats; and pontoons with full bars including stools, blenders, and pop-up TV’s. Wow. Well, here’s another wow for you: some builders are now making high-performance pontoons. And recently I had the chance to run a 25-footer with an F350 Yamaha 350 HP outboard on the transom. Yes, 350 horses on a 25-foot ‘toon. Long story short, when I nailed the throttles on the Aqua Patio 250 XP the boat practically leaped out of the water, and built up one serious head of steam. A bit of trimming, and the next thing I knew I was doing 60 MPH. On a pontoon boat. (You don’t believe me? Here’s the proof on video). 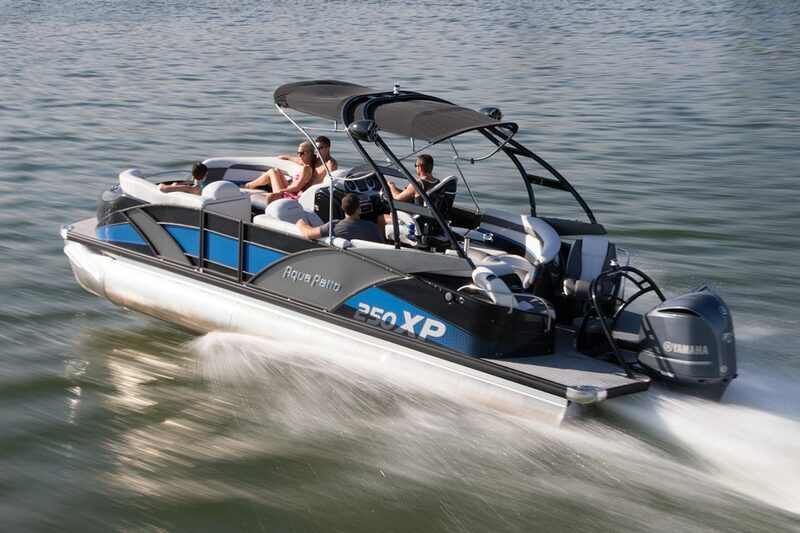 Now, in truth it’s unfair to call the 250 XP and other high-performance boats of its type a “pontoon”. In fact, this is a tri-toon. Most heavily-powered pontoon boats have a third log running down the center, which adds planing surface and helps keep all those pieces-parts together when racing across the lake at eye-watering speeds. Also, as a result of having that third pontoon in the middle, handling is a lot better than in would be. True, at 60 MPH the 250 did have an outward lean in turns and I did find it wise to pull back on the throttle before initiating a hard turn. But with just two pontoons, going into a hard turn can make you feel like an egg sliding across the griddle. What about handling waves? I can’t say if it’s the sheer size, the third log, or a combination of the two, but the 250 XP ate up the one-foot lake chop we encountered. And I’ve found the same surprisingly good seakeeping abilities in other tri-toons, as well. The bottom line? The next time you feel like poking fun of a pontoon boat, you might want to think twice. Especially if they’re challenging you and your monohull to a drag race.